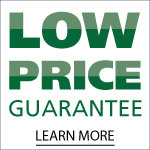 Call (800) 746-5647 for the absolute lowest price on this product. If a stair lift poses a tripping hazard at the bottom of your staircase, the Rave Stair Lift with Folding Rail was designed for you! The folding rail folds out of the way when the lift is not in use, and conveniently folds down as needed. The AmeriGlide Rave is an ultra-compact stair lift designed to make restoring accessibility to your multi-level home as convenient and easy as possible! 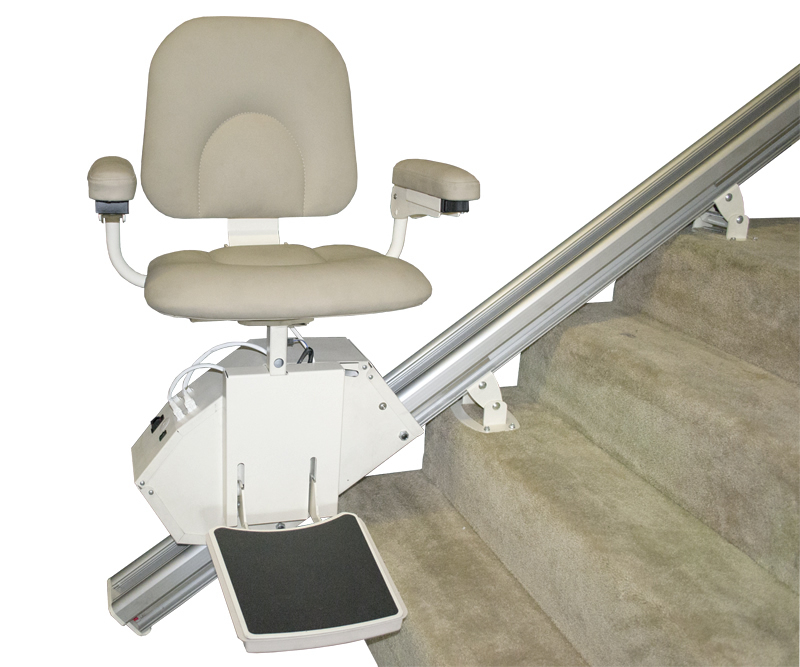 Homeowners with exceptionally narrow stair cases will love the ultra-thin design of this stair lift. 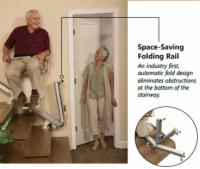 The lift unit takes up only slightly more than 11 inches when folded, allowing able-bodied housemates and guests optimal access to the stairs. The AmeriGlide Rave is built for durability, with a tough all-metal case construction that withstands normal wear-and-tear far better than other comparable stair lift brands. 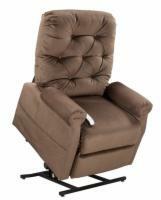 The powerful worm-rack system can safely transport up to 350 pounds of user weight, and an adjustable-height padded seat with durable folding arms ensures that you will remain comfortable during transit - the seat measures in at 19 inches wide and 14 inches deep. The AmeriGlide Rave differs from many of our competitors' stair lift units in that the track attaches to the stairs themselves rather than the wall, and every point of contact uses a single bracket, making installation easier on homeowners and handymen. The Rave is compatible with any standard household power outlet, and the battery that powers the unit charges at the top or bottom of the track, providing a reserve of power that keeps your stair lift going even in the event of a power outage. 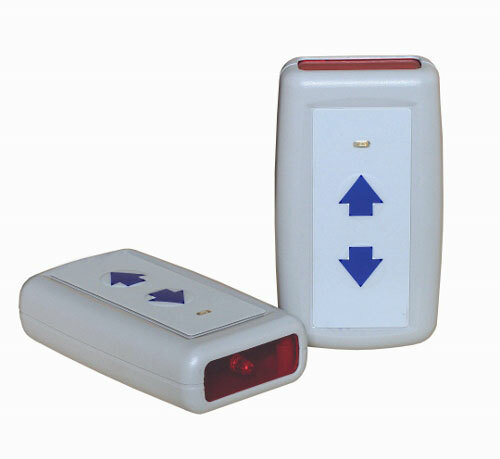 An arm-mounted operation switch is included as a standard feature, along with AmeriGlide's standard array of safety switches that prevent the lift from operating if an obstruction blocks your path. The seat swivels at the top, away from the steps, so the rider can safely exit or enter the stair lift. Best of all, the AmeriGlide Rave is a product of American ingenuity and workmanship, and every unit is manufactured right here in the United States of America! 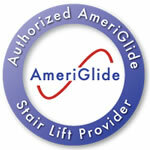 Stair lift users need a unit that is safe, comfortable, reliable, and easy to install. The AmeriGlide Rave satisfies all of your needs. To order, contact our mobility specialists today! Unit Footprint, In Use 22.5"
* Actual track is 6" longer. A 6" overrun is required to allow safe entry/exit from seat onto the landing at top of stairs. Remote and limited access locations include islands that require ferry access. Please enter measurements in feet or inches. Customers using the Measurement Service can skip this step. Stand at the top of your stairs, extend your tape measure until it is laying on all the stair treads and the tip of the tape measure is touching the landing at the bottom of the steps. 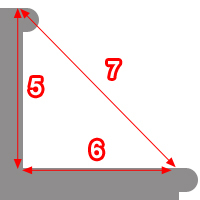 Measure from the edge of the top step to the edge of the first step (in inches). 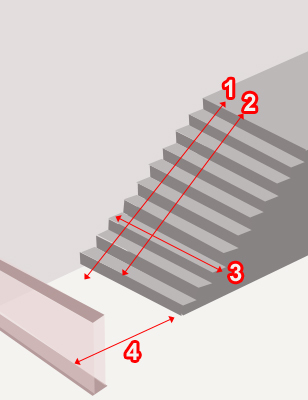 Measure the width of your staircase and enter the measurement (in inches). If there is a wall or a door at the bottom of the steps, measure from the bottom step to the wall. Measure from the top of a step to the next stop down. Measure the depth of one step. Measure from the front of one step to the front of the next step down. Measure from the top step to the door, wall, or other obstruction at top of the stairs. Need help measuring? Print out the "How to Measure" worksheet. Wanting the best for dad from Georgia would recommend this to a friend. Prevents my dad from having to walk up our very long staircase to his bedroom. Many days it was too much for him to do, now we don't have to worry about it. Especially on days he's too weak or tired to get back up there after dinner or coming back in from an outing. Having it makes us feel more secure and reduces my stress level when I'm not home. The installer told me this was one of the best stairlifts on the market. Not to mention he was extremely pleasant and knowledgeable. Overall, I feel we made a very good choice.